As resources go, paper is pretty simple. Fantastically useful though, don’t you think? Except it’s bulky. Not one sheet on it’s own, of course. But pile together hundreds of them and you can see how offices quickly get cluttered. Also, paper comes from trees and there are only so many trees out there at any given time. Which means that wasting this particular resource, simple as it may be, is something of a no-no if you want to maintain your environmental credibility. For both of these reasons, the idea of a paperless office has been growing increasingly trendy in recent years. If you’re not on board with the idea yet, here are a few ways to get started. This may seem like a very unnecessary place to start, but the fact is that unless you make a conscious commitment to go paperless nothing’s really going to change. If you set a big goal like ‘completely paperless’ then even a significant reduction would be a great achievement. You’ll also need to put a little bit of thought into how you communicate this new venture to your team because, let’s face it, we all know how most people feel about change. See, this is a key example of where you’ll need everyone to be working towards the same goal. It’s no use getting your bills and bank statements sent electronically if the company is going through several reams of A4 every day printing off stuff that really doesn’t need to be printed. Why not add management controls to your printer, giving individuals their own logins and then keeping an eye on who the wasters are? While you’re at it, set all computers up to automatically print double sided. Our friends at Prolific Solutions can help you with all that stuff. Ok, we hear you say, but some documents simply have to be printed. Like stuff that needs to be signed. Well actually, that’s not true. There is software out there that means you can now sign documents without the need for paper or pen. And it’s just as legal as the traditional method. Just ask local Bristol firm, Signable. Do you and your team take notes when you go to meetings? What do you use? If the answer is notebooks, you’re creating a whole stack of needless paper bulk right there. What’s wrong with a laptop, tablet or SMART phone. Synching electronic notes to the Cloud also means you’ll never have to worry about leaving your important briefing notes on the train. You know those feedback sheets you hand out at workshops, networking events and the like? Not necessary. By switching over to a digital feedback system – even something as simple as a SurveyMonkey questionnaire loaded on a tablet – you’d not only save paper but also data entry time. Far easier to get the respondents to enter their thoughts directly into handy tablets. There’s no need for multiple copies of the same file to be printed off for different people to work on. Not only is it confusing (“The latest draft? Um, well I think it’s the one Bob was working on yesterday…”) it’s also a waste of paper. Google Docs, Trello and other file sharing systems are far more efficient. This is probably the single most important step you can take to reduce the bulk of paper stored in your office – which, incidentally, is costing you money in rented office space. Wouldn’t it be better to have a digital archive, cleverly indexed and so easy to search it will make you wonder why you didn’t do it years ago? (Hint: the answer is yes, it really would be better). Any originals still needed could then be stored off site, and the rest securely destroyed. 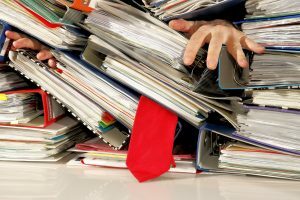 If you’re serious about creating a paperless office, get in touch to find out how we can help with storage, scanning and secure destruction of all paper documents.